"Why is it that at a bachelor's establishment the servants invariably drink the champagne? I ask merely for information." "I attribute it to the superior quality of the wine, sir. 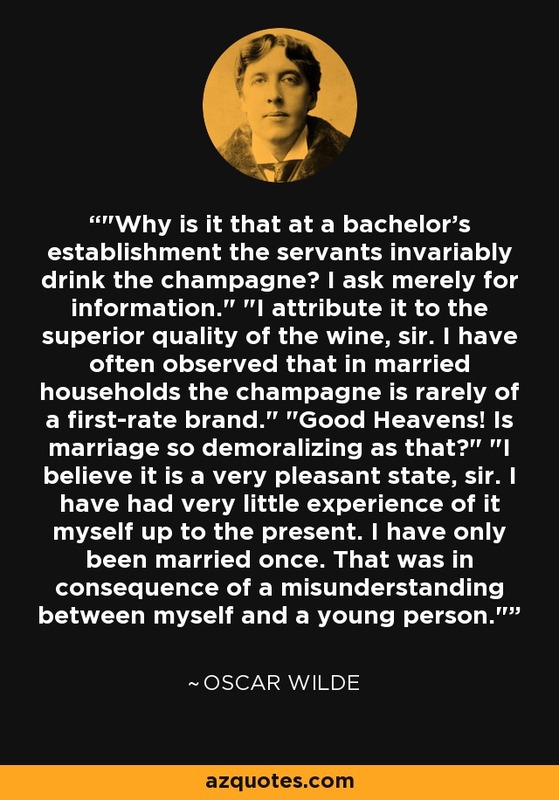 I have often observed that in married households the champagne is rarely of a first-rate brand." "Good Heavens! Is marriage so demoralizing as that?" "I believe it is a very pleasant state, sir. I have had very little experience of it myself up to the present. I have only been married once. That was in consequence of a misunderstanding between myself and a young person." "The Importance of Being Earnest".